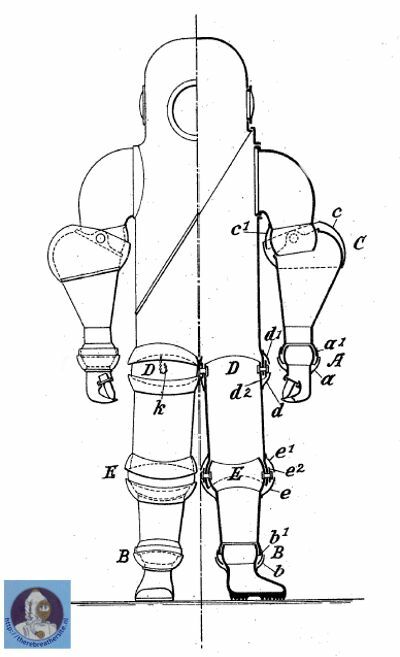 This article will restrict itself to the history of Atmospheric Diving Suits (ADS), also called Armoured or Articulated Diving Suits, produced by the European firm of Neufeldt and Kuhnke. As part of the introduction, a brief chronology of the company’s evolution from 1899 up to 2000 will be given. As material, both written and photographic, concerning the Neufeldt and Kuhnke armoured suits is scarce, and when available is often very fragmentary, I received a great deal of support from Gary L. Harris (the author of the book Ironsuit). I wish to thank him for his final remarks and corrections. I also wish to thank Giulio Melegari and Giancarlo Bartoli for their vital assistance. In 1899 the company was founded by Hans Neufeldt and Karl Kuhnke. 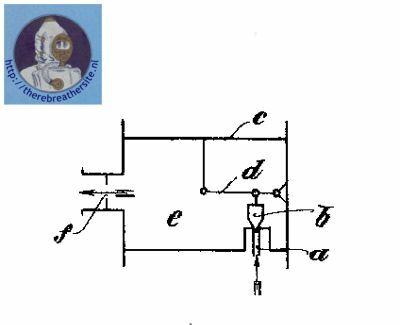 In 1905 they took over the firm of Ludwig von Bremen, that distributed, among other items, the diving equipment of the French concern Rouquayrol-Denayrouze and renamed the firm Hanseatische Apparatebau Gesellschaft (HAG). In the world-wide recession period of 1937 the name of the firm was again changed to: Hanseatische Apparatebau Gesellschaft Neufeldt and Kuhnke (HAGENUK), then subsequently to: HAGENUK formerly Neufeldt and Kuhnke. They continued to produce diving equipment and other items, up to 1960. By 1998 the company had been taken over by another firm but went bankrupt within a year. The production facilities, which were mainly concerned with electronics, were acquired by a foreign group of investors in the year 2000. 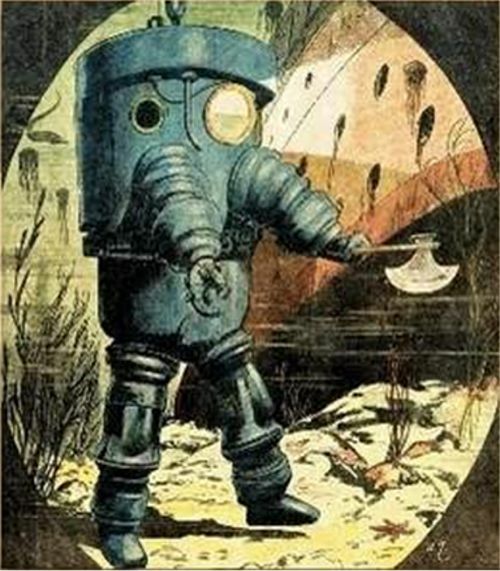 In the latter decades of the 19th Century a variety of armoured diving suits were developed to penetrate to deep depths in comparison to that which could be achieved by standard helmet divers. 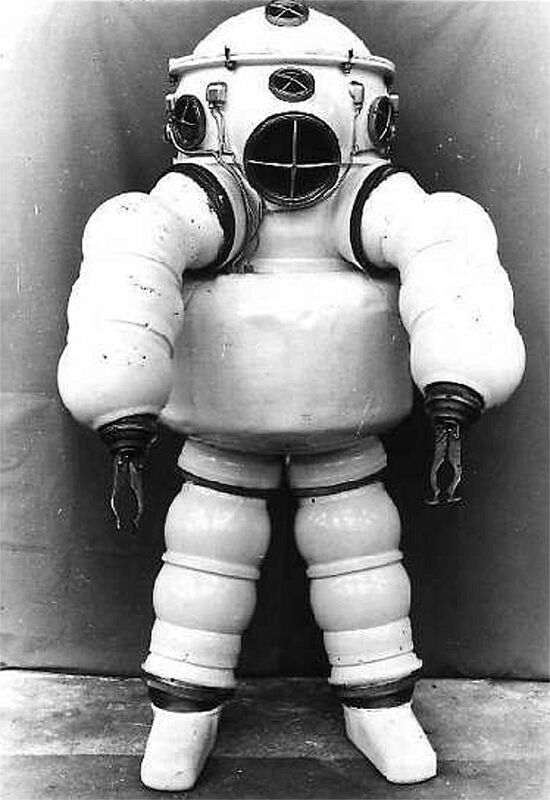 All ADS suits were based on the principal of a completely closed suit, with a rigid shell (hull) that provided protection against ambient pressure at depth. 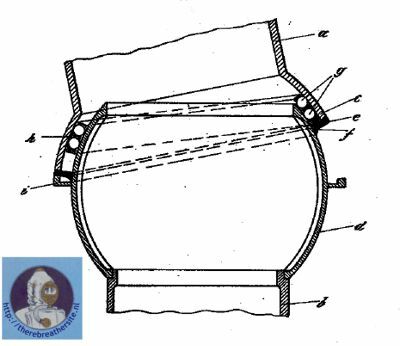 Within this rigid, closed shell the ADS diver breathed air or a gas mixture at an atmospheric pressure of one bar (14.7 PSI, 101 kPa). This allowed the diver to achieve greater depths and long exposures without being subject to extensive decompression times. 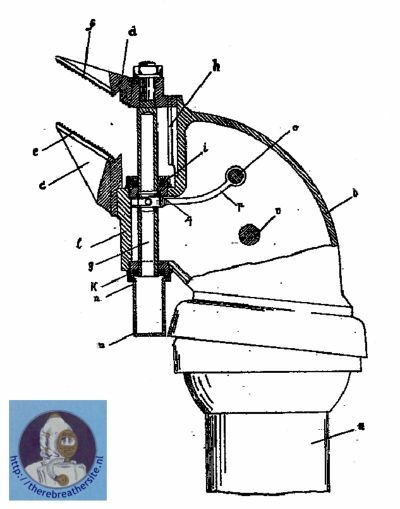 All of the ADS inventors historically encountered the same general problems, among them were (1) shell resistance against water pressure, (2) the lack of general mobility (locomotion), (3) poor articulation (flexibility) of arms and leg joints. And, the difficulty of providing a breathing air supply, or other gas mixture, still presented technical hurdles. The first ADS developed by Hanseatische Apparatebau Gesellschaft (HAG) was generally based on a suit, designed in 1906, by the German inventor Friedrich Gall. 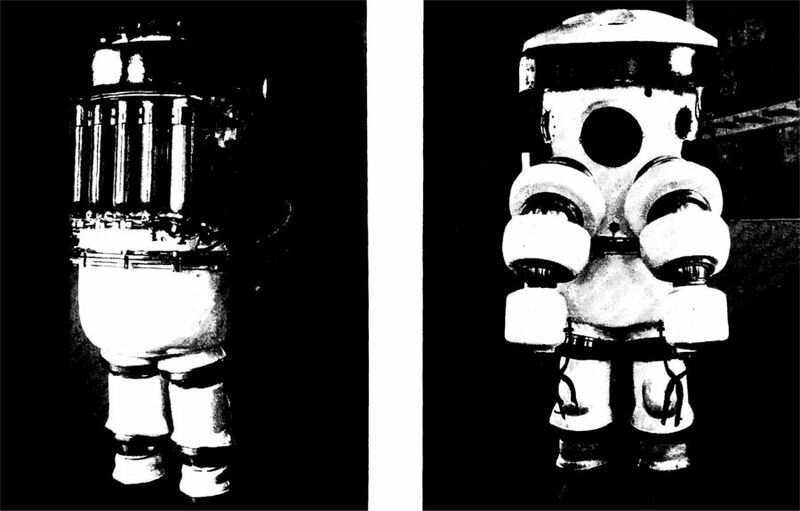 One of the major improvements that HAG incorporated into the suit was precise manufactured and polished ball-and-socket joints to provide articulation of the arms and legs. 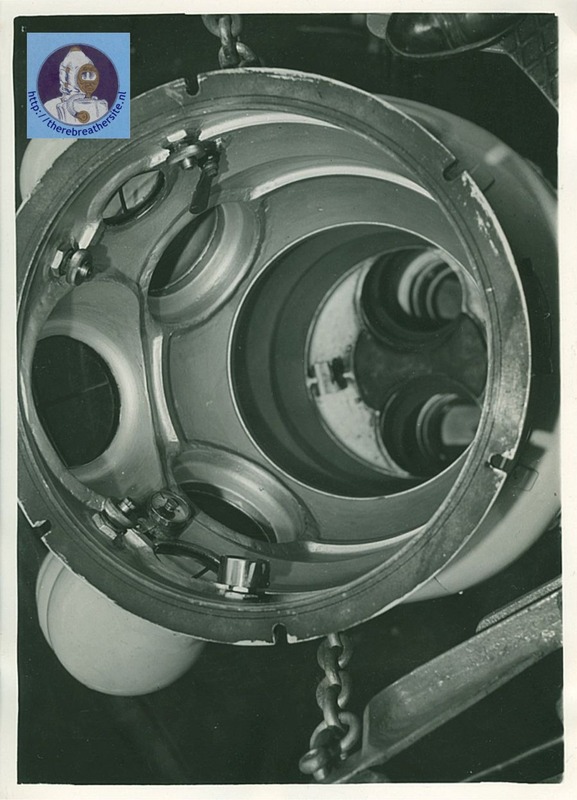 These ball-and-socket joints were made watertight by a ring-like rubber skirt that pressed against the steel ball section of the joint. This rubber seal worked much the same as a human eyelid on the eyeball. One problem with this design was that as ambient pressure increased with depth, the rubber skirt sealed down harder against the steel ball. The greater seal pressure created friction between the seal and ball, thus limiting joint articulation to depths less than about 100 meters (around 300 feet), and even at this depth it took an exceptionally strong man to flex the joints. Near 150 meters (about 480 feet) it was no longer possible for the diver to move his arms or legs. A second problem was corrosion and pitting of the steel ball by ball-bearing pressure and seawater. 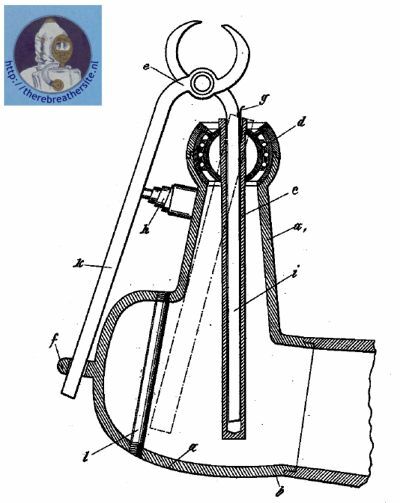 The first suits were designed with a total of twelve joints, but for reasons of leakage around the seals, this amount was later reduced to the minimum necessary. The basic components of the suit are the pressure resistant trunk and arms and legs. The trunk and the fixed hollow limbs are made from forged steel. In the two earlier generation of suits, the trunk was separated into two parts at the waist by a bolted flange. This flange allowed the diver to don and doff the suit and it was bolted together and sealed after the diver entered the suit. 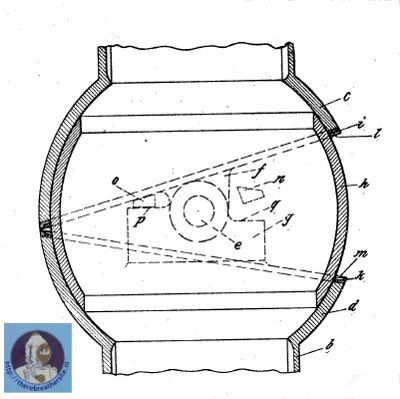 The latter generation of suits were entered by means of a detachable hatch that was sealed with six “T” shaped hinged bolts (akin to a pressure cooker lid). Each armoured suit was equipped with a number of thick glass, pressure resistant view ports that allowed the diver to see down, left-to-right and overhead. 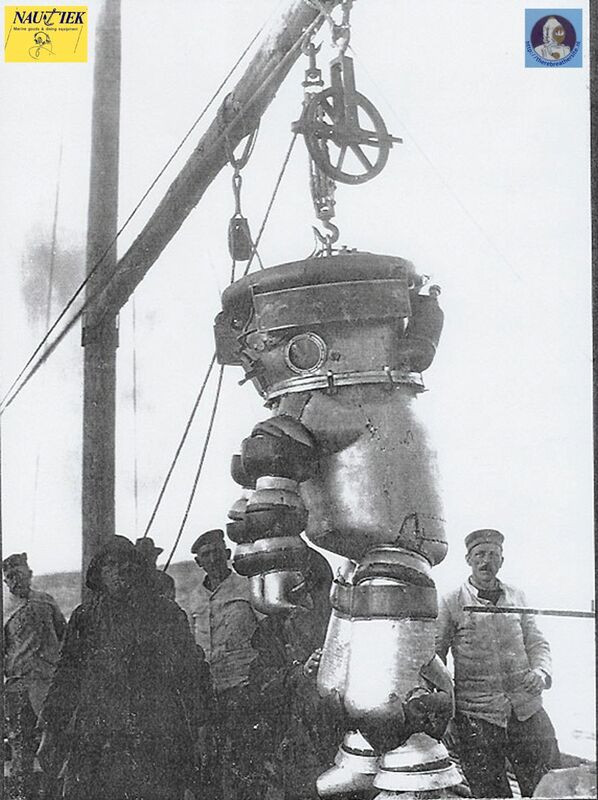 On some designs the trunk was attached to a ballast tank which allowed the adjustment of buoyancy by means of valves inside the suit. 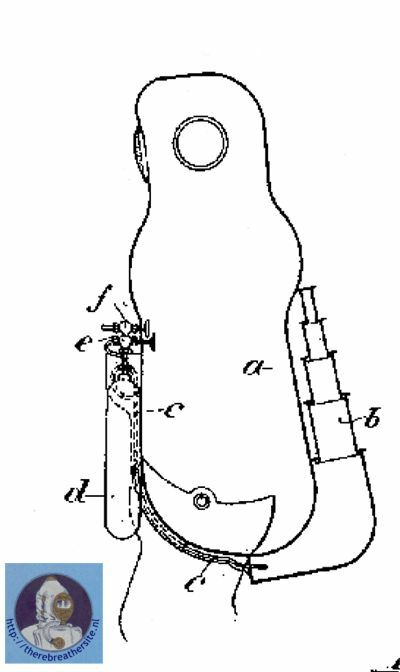 As early as 1913 Neufeldt and Kuhnke received a patent which described a device for adjusting the buoyancy of armoured diving suits. 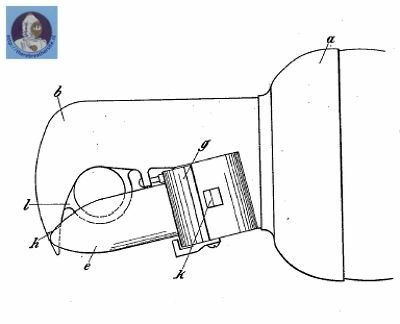 This patent consists of several telescopic tubes that could be pushed out by compressed air (a variable volume mechanism). If there ever was a practical implementation of this system, it is unknown.However, with their standard buoyancy system, water or air could be admitted to the buoyancy tank to raise or lower the ADS in the water column. With the ballast tank completely flooded a negative buoyancy of 75 kg (about 165 pounds) could be achieved. Surface dry weight of the early Neufeldt and Kuhnke suits was around 450 kg (990 pounds). The adjustment of buoyancy and the flexibility of the joints gave the diver a limited vertical, forward-backward and sideways motion. He could also bend fore and aft to a certain degree and was able to perform activities in differing orientations. 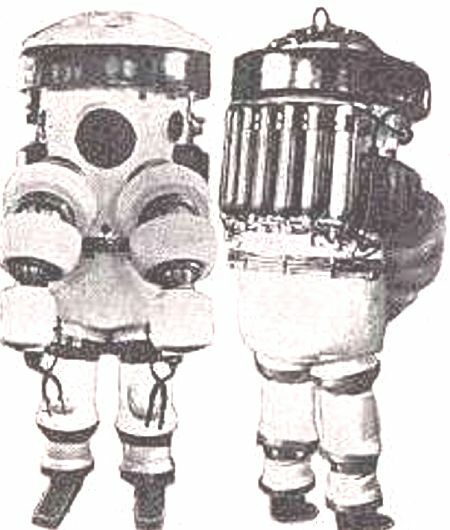 To provide the fully enclosed diver in the suit with a breathing mixture, an oxygen rebreather was installed in the trunk of the suit. 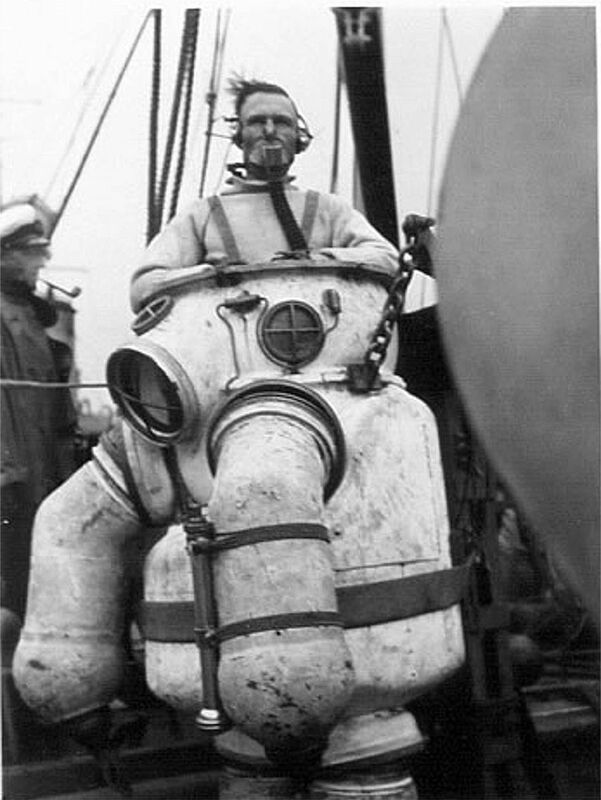 This manually controlled rebreather generally consisted of an oral-nasal mask. The mask hose was attached to a carbon dioxide scrubber canister and a manually metered oxygen supply. On some systems the diver inhaled suit air through a one way valve on his mask. The expired air then flowed through a rubber hose to the scrubber where the carbon dioxide was absorbed. 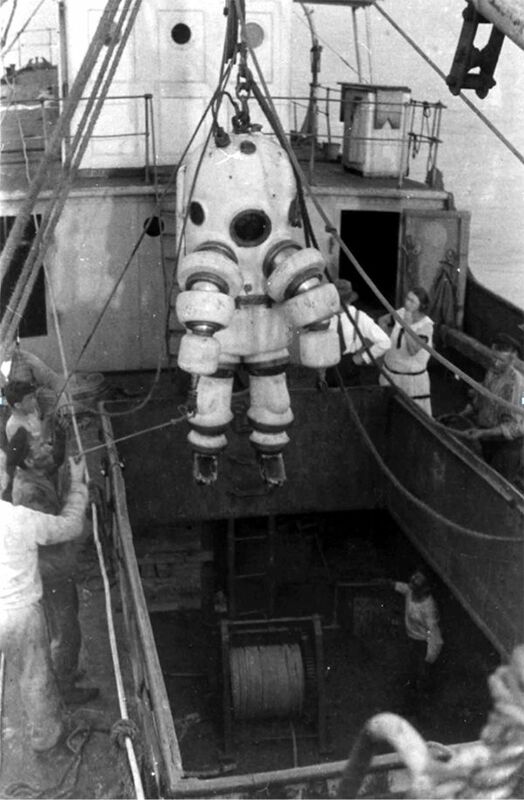 Mounted in the trunk of the suit was a pressure gauge on which the diver could read internal suit pressure. 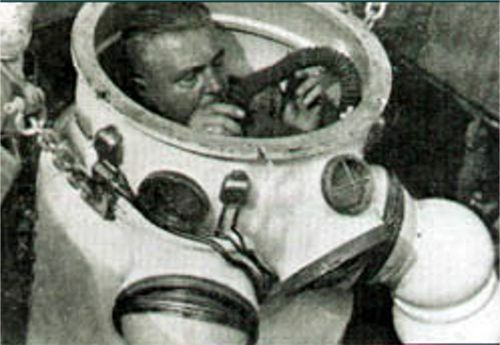 As suit oxygen was consumed and internal pressure dropped below a certain level, the diver would manually open an oxygen valve to adjust suit oxygen to an acceptable level again. 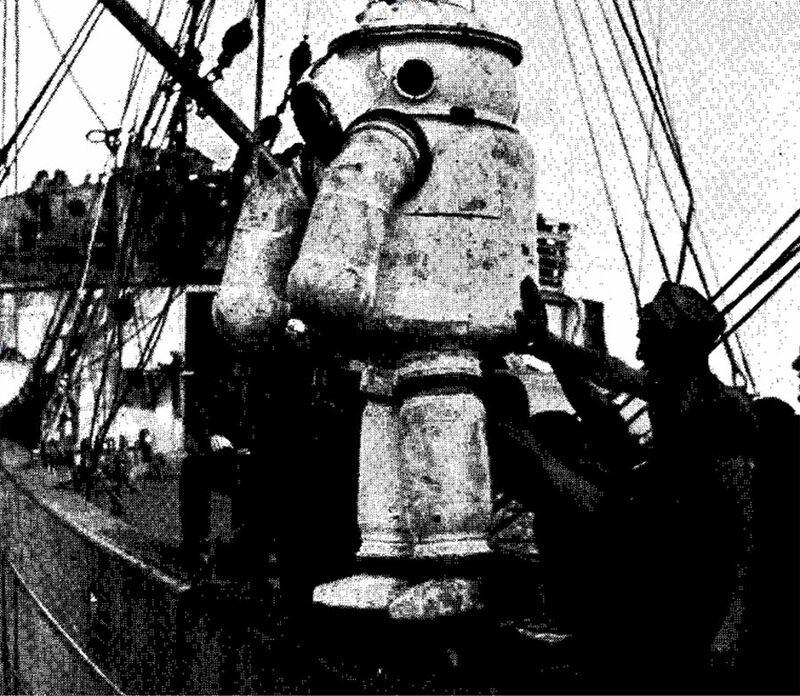 The armoured diving dress was connected to the surface by a steel cable and communications cable. In case of an emergency the diver had the ability, from inside the suit, to detach the ADS from the two cables and float to the surface. 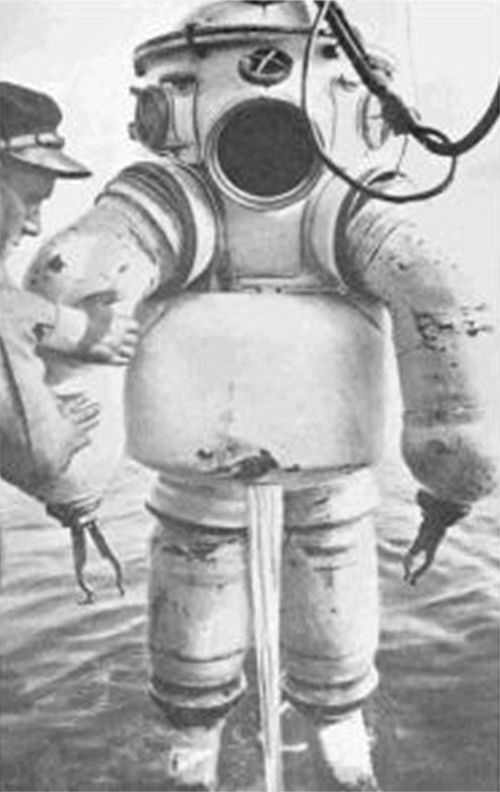 Further, he had the option of adjusting the suit’s ballast tanks to where he could remain at the surface until retrieved. To test the resistance of the closeness of the equipment, trials were held in depths of 93, 142, 75 and 116, meters, where the suit was ballasted according to that of the diver and during 1.5 hours was exposed to water depth. After a few minor repairs the equipment shows reliability and is watertight. On 27.09.1916 the inventor dives in presence of the representatives of the finance department, Klein and Fischer. To a depth of 114 meters. Duration 53 minutes; bottom time 32 minutes. The diver is hoisted to the surface in 1.75 minutes. Suit nearly dry. The diver feels well. The mobility of the joints was in general good. The practical limit on the type 1916 is estimated at ca 80 meters. 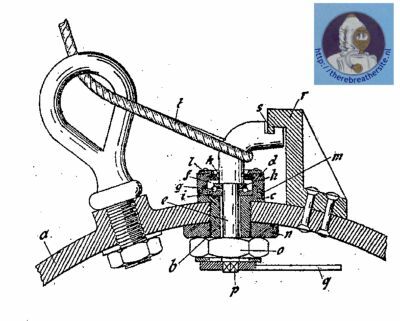 On 29.09.1916 the inventor and his – not as a diver trained – assistant, dive in presence of the Privy Council, Baron von Gemmingen-Guttenberg to 77 meters during ca 20 minutes. Suit watertight and all OK. The inventor dives again on 06.10.1916 to 80 meters during 40 minutes. The air in the suit was well and everything was all-right. Successful walking exercise to find a sunken object. Without illumination impossible. Diving test to 62, 59 and 58 meters during 40-50 minutes. Walking exercise and work tests with a tongs like manipulator. Work dives in shallower depth. Longer walking tests, followed by working on sunken objects (hanging chests onto hooks, untying knots) are done. Duration of the trials 30-60 minutes. Successful trials to 66 meters to test an underwater lamp. Except minor variations we can distinguish three different types of Neufeldt and Kuhnke suits. The trunk was separated at the waist into an upper and lower torso joined by a bolted flange. The upper torso contained the buoyancy tank and the arms. 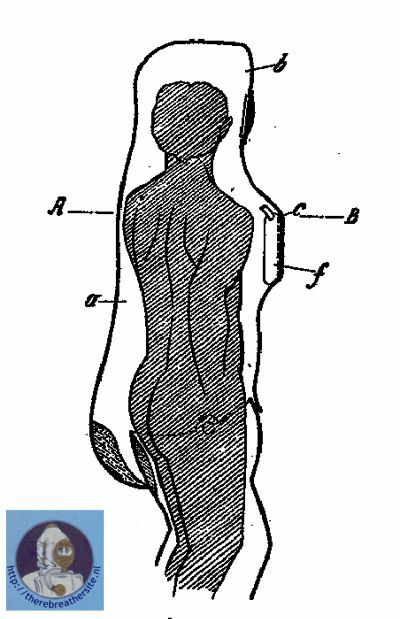 The top of the torso was provided with two unprotected air bottles to regulate buoyancy. At the end of each arm, which was composed of three ball and socket joints, there was originally mounted an artificial glove-like mechanism, that could be manipulated from inside the suit. This approach quickly proved to be impractical, as it was difficult to articulate and even at moderate depths it leaked excessively. Latter, the glove mechanism was replaced by a system of grippers (what we call today: end effectors). The legs, each also divided into three ball and socket joints, similar to the arms, were attached to the lower part of the trunk (lower torso). The breathing provision for the diver was installed inside the trunk, as was the telephone and control system. The suit was provided with four view ports. This generation of ADS suits was more or less a variation of the equipment produced previously. The shape of the suit was more streamlined due to an improved production method of the trunk. 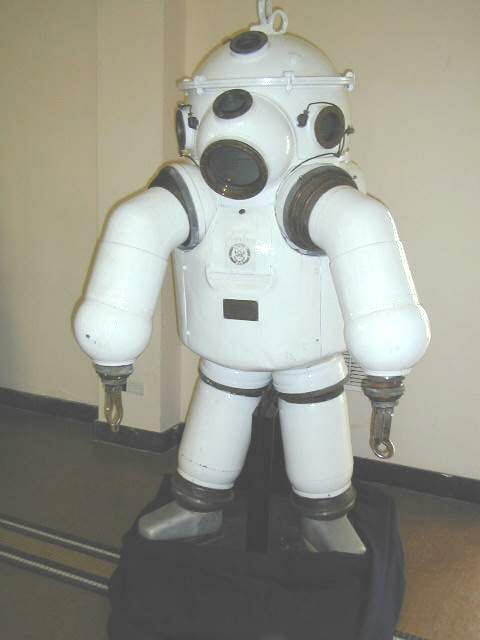 The suit was still composed of the upper and lower torso, separated at the waist by a bolted flange seal, like in the earlier model. Latter types have a more rounded head with the buoyancy tank on the dorsal area. The arms and legs were still assembled with three ball and socket joints each. To avoid fouling of the diver by the unprotected air tanks, and their accompanying piping, the tanks and cylinders were covered. The history is unclear as to when the shape modification of the upper torso took place. 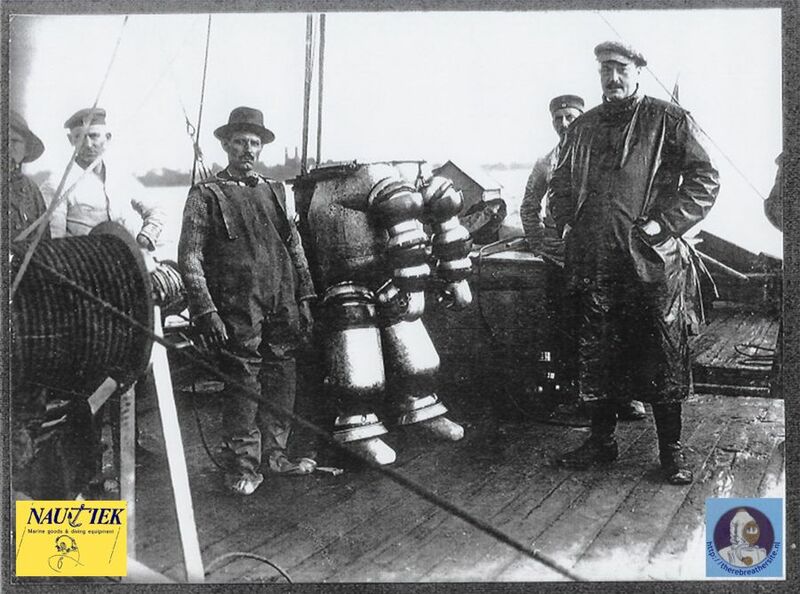 Incidental to this chronology is that in November 1925 the German diver Otto Kraft established a record with a Neufeldt and Kuhnke armoured suit during a working dive to a depth of 75 meters (230 feet). This dive was undertaken to search for the British submarine M-1, sunk after a collision with a Swedish steamship. It is unknown if he used a suit of the first or second generation. 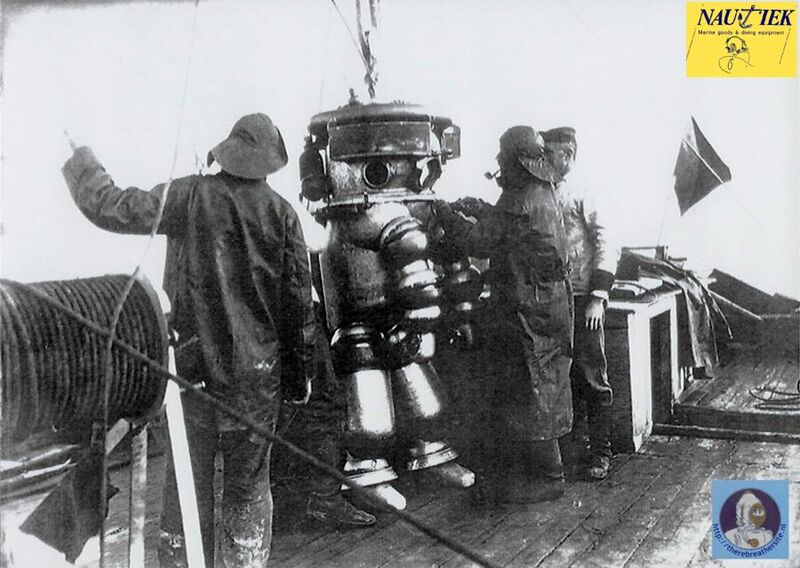 In the early 1920s, the Frenchman Alain Terme acquired a Neufeldt and Kuhnke suit for undertaking attempts to locate several shipwrecks with valuable cargoes. One of them was the Egypt. In 1924 the famous Italian company SO.RI.MA. (Società Ricuperi Marittima) was founded, more or less with the same objective. Two years later Terme joined forces with SORIMA and transferred the armoured diving suit to them. The initiative to simplify the armoured suit to increase its practicality and functionality was created by SORIMA. 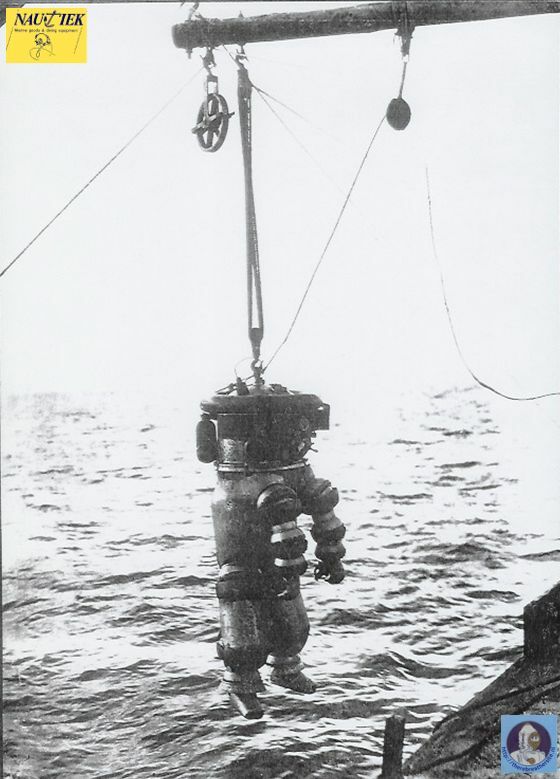 This company had employed the Neufeldt and Kuhnke suits of differing types (second and third generation) for recovering valuable cargoes from several shipwrecks in deep water. (e.g. Washington, Elizabethville, Egypt) SORIMA acquired the Italian rights to the ADS suit. The major modifications included: (1) The total amount of ball and socket joints was reduced to six to further limit potential leakage, (2) The entry opening (don – doff hatch) was moved to the top of the upper torso so the trunk could be cast as one solid structure, (3) The buoyancy tank was moved to a lower level on the trunk. The last measure gave the suit a more natural centre of gravity while submerged and had the added benefit that the suit entry opening floated higher above the water when not submerged. Also, in a latter phase, the straight elbows were replaced by curved and lighter ones, an innovation added by Robert Galeazzi. 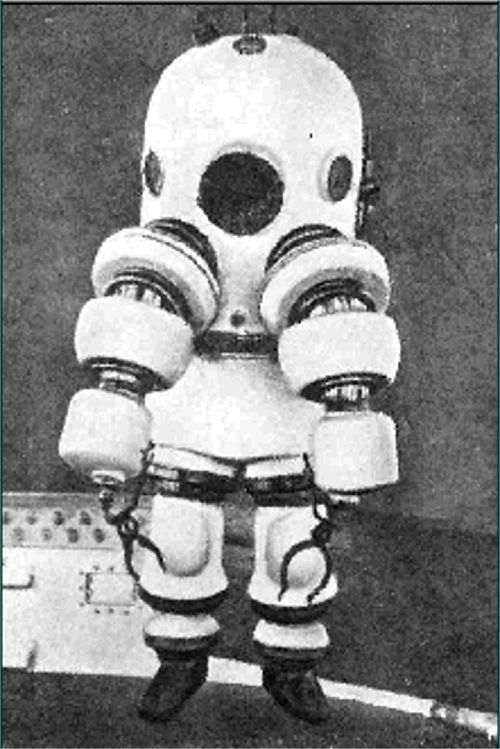 Early diving operations with armoured diving suits at great depths, such as those carried out by SORIMA, had conclusively shown that nine/tenths of the work for which even the best armoured suit was capable, could be performed equally well by a simple observation chamber like that designed by Robert H. Davis in 1912. It was evident that in many cases the diver in his armoured suit was merely an observer and director of operations. He stood by and gave orders through the telephone to the surface crew with regards to placing of explosives or the maneuvering of a grab. 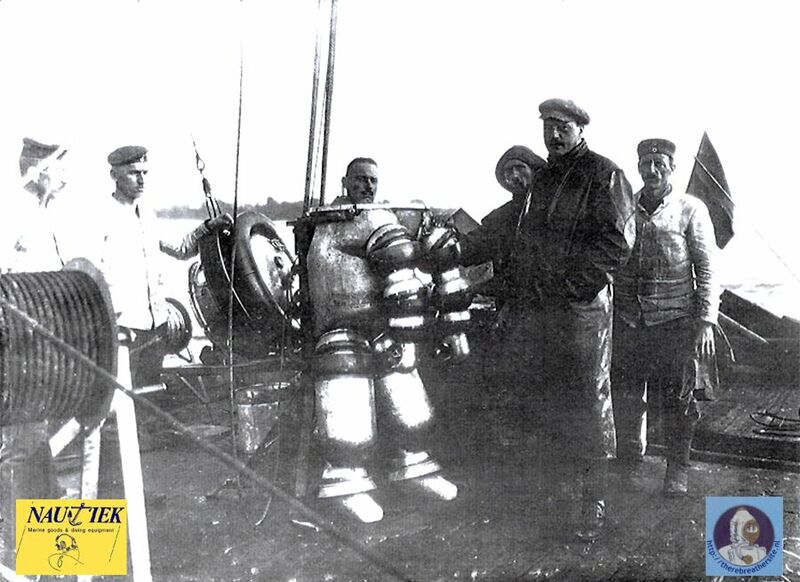 In the late 1920s and in the early 1930s (i.e.1928 – 1934) Neufeldt and Kuhnke and Galeazzi, relying on the considerable field experience put together by SORIMA divers, largely cooperated to manufacture improved and more reliable armoured suits. In 1935 the Galeazzi Company started their own ADS which in 1938 established the world depth record of 200 meters (600 feet). Neufeldt and Kuhnke obtained numerous patents in differt countries in the world. It is a true study to read all the patents they had. 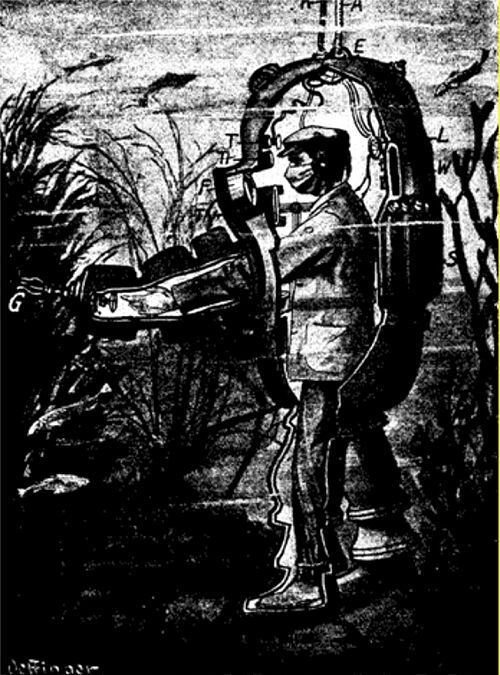 Neufeldt und Kuhnke, a German company from Kiel was the first producer of atmospheric diving suits produced in lager numbers. The company obtained a large number of patents and sold their suits during 27 years! I am very pleased that my good friend Jan de Groot of Nautiek diving in the Netherlands studied this company during many years and wrote a fantastic historical review about N&K. I am very pleased Jan allowed me to publish his work on my website. This article is the most comprehensive and detailed article about the history of N&K.